"Canadian university researchers have found a new way to track the movement of ozone between layers of the atmosphere, a discovery that could lead to improved forecasts and pollution warnings. Ozone is in the atmosphere at two levels. In the upper levels, it filters potentially damaging ultraviolet rays. At the lower levels, it becomes a pollutant that harms crops and human health, including irritating eyes and making breathing more difficult. When ozone changes levels, it is called an "ozone intrusion." Scientists from the University of Western Ontario in London discovered they could track the movement of the upper ozone into the pollutant levels using a RADAR instrument called a windprofiler, developed in conjunction with York University in Toronto. 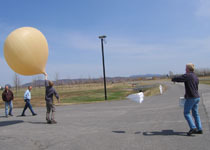 The team, led by researcher Wayne Hocking, released balloon-borne, ozone-detecting instruments into the skies in Quebec and Ontario, and measured the altitude using the windprofiler." "Better short-term weather forecasts and more advance warning for smog alerts are probable payoffs from a Canadian breakthrough in using special wind-tracking RADAR. An Ontario-Quebec research team, including three scientists from Toronto, paved the way using specialized RADAR that continuously measures wind speed and direction at all heights from near the ground up to 15 kilometres." "The study was conducted in southern Quebec and Ontario using ground-based RADAR and more than 100 scientific balloons launched between April 2005 and August 2006. "What surprised me was that we seemed to see these intrusion events whenever we looked," says co-author David Tarasick, a research scientist with Environment Canada. The team witnessed at least one intrusion during each of its five 10-to-14-day field campaigns, suggesting they may be occurring almost weekly. Ozone is an environmental friend or foe, depending on where it is. In the stratosphere, which begins About 10 kilometres above the ground, it forms a protective layer that absorbs harmful ultraviolet solar rays. But at ground level, ozone is a key component in smog that harms human health, forests, and crops. Smog is normally associated with pollution from automobiles, power plants and factories, and Mr. Hocking and his colleagues say human activities are clearly a major contributor to the smog that often chokes the Vancouver region and the Windsor-to-Quebec City corridor. But the scientists say the intrusions of ozone from the upper atmosphere can make significant contributions to smog and air quality. Turbulence generated by winds racing through the upper atmosphere is believed to cause the ozone to drop down. The scientists say turbulence generated as winds speed over the mountains in Western Canada also generates intrusions."